If you can’t be talked into a reuben, this smoky, spicy, salty tofu preparation can be sliced into vegetarian tacos, sandwiched in bread with lettuce, tomato and avocado, or eaten alone as a snack. The recipe as written below isn’t overly spicy, so double the chipotles if you want a real kick. Chipotle Baked Tofu (adapted from Moosewood Restaurant Simple Suppers): In a small bowl, combine 2 Tbsp. canola or other neutral-tasting oil, 2 Tbsp. soy sauce, and 1 Tbsp. pureed chiptoles in adobo. 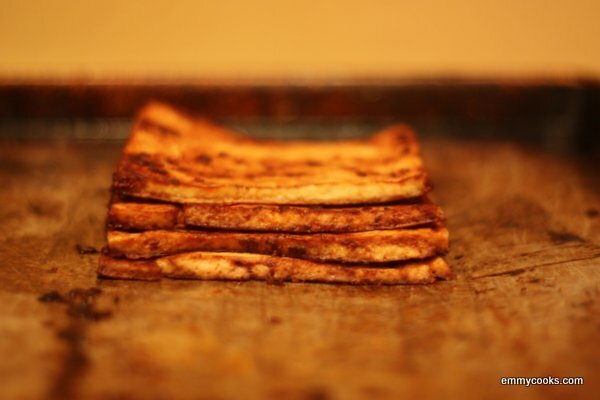 * Slice a block or two of tofu into 1/4″ planks (as shown). Brush the sauce onto both sides of the tofu slices (I find that this amount of sauce is enough for two blocks of tofu). Bake at 400 degrees for 20-30 minutes, until the edges are a little crisp and the tofu’s consistency has firmed up to your liking. *Do yourself a favor: buy a can of chipotles in adobo, dump the whole thing into your blender, and puree it. Store the smoky, spicy puree in a clean jar in the fridge and use it on everything. Very cool – Sending it on to my dad who’s vegan! Indeed you can convince me. I like tofu. I’m having some for dinner. And I did mean to go back and comment on your tofu sandwich, which looked really good! Ok, phew. I just wouldn’t want you to miss out on it, you know. I keep wanting to make your roasted plum frozen yogurt but the plums are so good I can’t stop eating them whole. Soon, soon.